Readers of Roni’s blog will know that our pet rat, Puppy, died a few weeks ago. Well I was looking through the news, and among stories of Britney Spears’s little sister being pregnant, and “don’t tase me bro!” being the top quote of the year, there was something actually interesting! 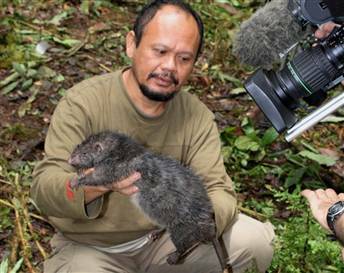 In a region of the Indonesian rain forest that is rarely explored and has been called the “Lost World” a team of scientist found a giant rat. Now, keep in mind that this isn’t some new breed of rodent, but this is actually a BIG rat. Apparently the rat had no fear of humans, and would wander in and out of the camp on a regular basis. They think that this rat might be a new species of rat altogether, a larger than average rat. One disappointing omission in the article was when these guys will become commercially available. Why just settle for naming a rat Puppy, when you can have a rat that is the size OF a puppy?